I never really got the chance to write about Ironman Copenhagen 2013. Time kind of ran away from me. It was not a terrible day, but not a good one either. I had planned to hold back A LOT on both the swim and bike, then run hard and hopefully fast. I did exactly that on the swim and bike but tactically this turned out to be a bad decision. On entering T2 I had a huge nose bleed that lasted for the first 5 maybe 10km of the run. No idea if this affected me physically (probably not), but it completely blew my concentration. Looking back on the race I just did not take on enough calories during the run. I really should know better. I came home in 8:59 and to be honest was disappointed & frustrated at how the day turned out. But this blog is not really about Ironman Copenhagen at all. It is all about Challenge Henley 2013 – a day I NEVER want to forget. Ten days before the race I was flying. I felt like superman. The numbers (SWIM, BIKE & RUN) were looking better than I had EVER seen before. The weather was set to be cold and wet – perfect racing conditions for me. I was totally convinced Challenge Henley 2013 was going to be the day where I would do ‘something special’. On Thursday night (two days before the race), I came down with a bug of some sort. I was congested and unable to sleep at all that night. The next day I had meant to go to the press conference but I was in no fit state. I stayed at home and tried to sleep it off. By Saturday morning I was feeling OK. Not 100%, but much better, so I made the call to go register, rack my bike and just hope I would be back to 100% come race morning. That night I could hardly sleep, not because I felt bad – the exact opposite in fact. I was excited and fully of energy. I remember just lying there looking at the stars for hours. By the time 3am came, any thought of illness had completely left my mind. I was going to start this race. Carli, my amazing wife, who is also 8 months pregnant was adamant that she was going to come to the swim start. So we left the house together both in good spirits with the music blasting out of the car. If you told me then, what lay in front of me I can honestly say I would have never left the house. However, if I went back to that moment right now, to stay at home that day would have been one of the my biggest mistakes. BUT I didn’t, and so it began …. I think it must have been one of my best swim starts. I felt strong and powerful in the water and latched onto Steven Bayliss’ feet. To my huge surprise, they were not moving away from me. I sat there for a bit but slowly I lost touch with him and he drifted into the fog along with the lead canon. I found myself leading a group of swimmers into the mist. I was not pushing hard and honestly at that point I felt good. We got to the turn buoy and out of nowhere I got hit by severe cramps in both my calves. I stopped, tried to stretch them out. I could loosen one, but my left calf was solid. It would not budge. I could see Joel and Tom (two of the race favourites) swimming away from me and had a split second decision to make. Stop or crack on. I didn’t really have enough time to think, so I just went on instinct and cracked on. The rest of the swim was utter agony with other muscles joining the ‘cramping’ party. Coming out of the swim I think I almost pulled two BIG volunteer support guys into the water. When I finally did get out, the cramp in my left calf was so bad my foot looked fully dislocated! I think it freaked a few of the helpers out! Anyway, with all my weight I managed to put my foot back in place, the cramp FINALLY went, and I cracked on through T1. Joel and Tom were 10-15 seconds ahead of me now so I needed to be quick. 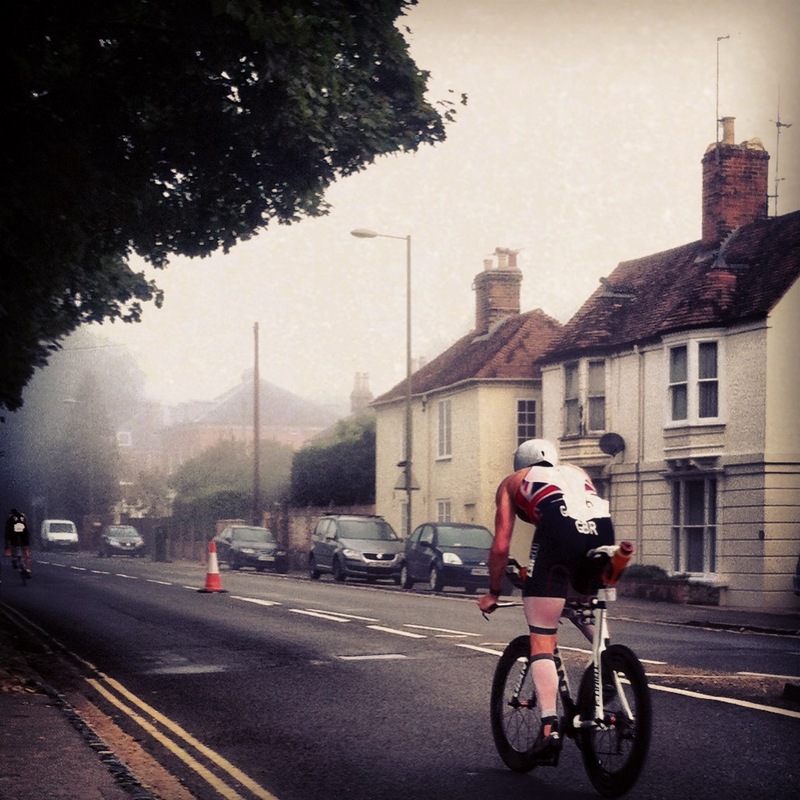 Out on the bike, Tom was only 20m in front of me and I focused on trying to reign him in. But I had nothing in my legs. That first lap I buried myself and the power numbers barely went above my easy zone 1 ride levels. Heading out on the second lap I felt this anger building and I gave it one final push to try and bring my race back on track. Pretty stupid really. It is hard to describe what happened over the next thirty minutes. To be honest I don’t really know. I just felt like my body was falling apart. My back started cramping, then my vision went a little hazy. After that …. I don’t really know. I just remember lying on the grass and a guy (later on that day I found out his name was Clive) coming over to ask me if I was alright? He offered me his phone and I texted Carli to let her know I was OK. I have no idea how long I lay there? 10,15 maybe 20 minutes. Clive would come over every now and again to check on me. Finally, I stood up….. to go home. It was down hill all the way into Henley. Carli had text to say she was going back to the car and she would meet me there. Then my friend Clive wondered over. I think he kind of assumed I was carrying on. I remember him saying in a really kind softly spoken way “carry on mate, come on, you can still do this”. My head was in turmoil. Yes, I could stand up and yes I could just about pedal. But the time I would walk away with and end result would be so bad….. It was hard to find a reason to carry on. I was embarrassed and ashamed of myself. All I can remember saying is “PRIDE (long pause) is a terrible thing sometimes” as the tears rolled down my face. I sat there for another 5-10 minutes battling with my own thoughts. Finally I stood up for the second time. I was not feeling any better, or any more positive about anything. It was just I could not sit there all day. I had to make a decision. Right to go home, left to carry on. As I stood up for that second time I still did not know what I was going to do. I just found my self on my bike turning left. I honestly don’t know why. I said to Clive “Tell Carli I am carrying on” and tried to smile. That second lap was very emotional. I went through stages of trying to fight and pushing the power, followed by long periods when I realised my body could just not handle it. The process repeated itself over and over again. I was balling my eyes out half the time. I felt pathetic! But I was still moving. At the end of the second lap, I stopped and gave Carli a big LONG hug. I really needed it and did not want to let go. Finally I did and started out on the 3rd and final lap of the bike. This lap was survival. There was no fight left. I kept saying to myself I would just make it to the next junction and then call it a day. I had decided I could not do it any more. This was it. I was done. But every time I got to one of those junctions a part of me deep deep down could just not let myself do it. So I would say to myself. OK to the next junction, then call it a day. FINALLY I found myself entering T2. I had completed the 3rd lap but that was it. NO MORE. I stubbled towards the side on the path and sat down. At this point I was beyond tears. I just stared at the ground totally spent, freezing and to be honest I don’t know what… Carli came over, put a jumper over me. We sat there for a long time. I kept saying “I don’t know what to do?”. I said it over and over again as if I would get an answer from somewhere, but of course I didn’t. I must have made the decision to quit dozens of time during that long 20 minutes in T2. But I could not walk away. I have no idea why, I just couldn’t. Eventually I asked Carli to get me a top to run in. My kit had my name, sponsors logo’s etc. on it. I was embarrassed, so very embarrassed to be racing as a ‘pro’. I felt like a joke. Finally, after maybe 30mins I started the run. From the second I left T2 my path was fixed. I have no idea why, it just was. Don’t get me wrong, my body was still ruined. My mind had quit a long time ago, over AND over again. But there was ‘something else’, don’t know how to describe it. It is so deeply part of who I am that I don’t know what word to use. It has always been there, but it is buried so very deep, I never really notice it. Anyway this ‘something else’ had been boiling under the surface all day. And as my body and mind faltered it had come right to the surface to take charge. It had been behind every decision that could not let me walk away and it was pulling me along right now. I found myself running, not fast, but I was running. As I passed the supporters going out on the first lap every smile, every friendly face, every clap, every cheer meant the world. It really really did. I tried to smile (probably failed badly) and say thank you to everyone. My emotions were still all over the place and again I spent most of the time running in tears. Half way round the first lap I passed my friend Clive. He did not say much. He did not have to. He just nodded, smiled said something like “you’re still here Chris”. As I came towards the end of the first lap I was passing some friends who had joined Carli. Their cheers and their smiling faces meant more than I can put into words. I stopped & gave Claire (a great friend) a hug. I just wanted to say thank you for coming down, taking the time out of your day to cheer me on, and sorry to be such a disappointment. The second lap was a bit of a blur – Literally. Not sure why but everything went hazy. The only thing I can really remember vividly is my niece Lucie handing me a bottle and shouting “come on Uncle Kanga”. I will never forget that moment. Oh and yes for those of you who don’t know me, my nickname when I was a kid was Kanga, for obvious reasons I hope. It is hard to believe that someone in the middle of an event like this would be able to quote the entire thing. But trust me he did! It is hard to explain but I felt like I was inside that speech. Its message consumed every part of me and from somewhere I found new strength. That is the only way I can describe it. The last lap was a very emotional one. When I ran past my bro, friends and Carli I almost broke down then and there. A bit further on Sophie, a friend I have not seen for a while, jogged with me for a few meters to cheers me on. I gave her a big hug. I just could not believe how kind everyone had been to me ALL day. 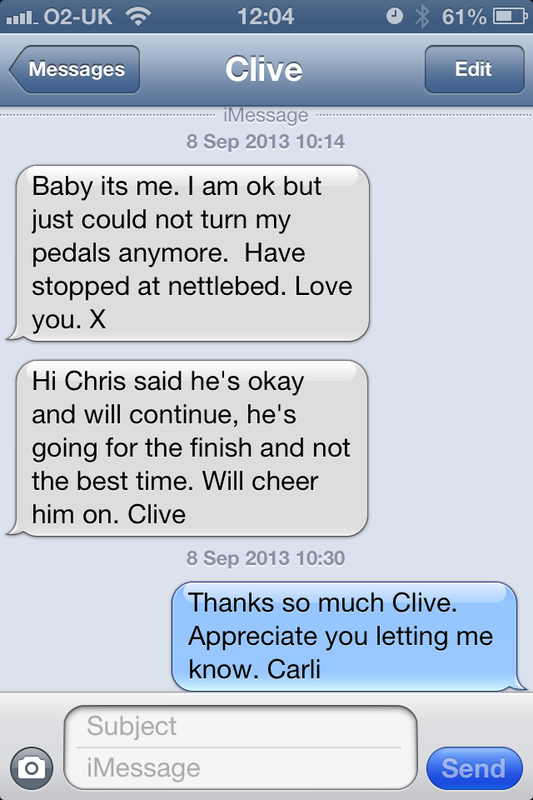 I remember passing Clive with 5km to go. He had a massive smile on his face and for the first time today, so did I.
I crossed the finish line of my 20th Ironman distance race in 10hr 50mins 29 secs. I am not going to lie, I was devastated. Afterwards, I sat there with my bro saying nothing for a long. There was noting to say. Later on I sent my coach a text that I think sums it all up pretty well. At the start of this blog I wrote “I was totally convinced Challenge Henley 2013 was going to be the day were I would DO ‘something special’.”. I am not going to claim that I DID something special, but to me Challenge Henley 2013 WAS ‘something special’. Over the last 8 years I think I have experienced just about every emotion possible in sport. It has been one hell of a roller coaster ride, but one that I would do over and over again if given the chance. I just want to say, THANK YOU, from the bottom of my heart to EVERYONE who has made this ride possible. Just awesome. You learn something from every race, pro or not, that makes you a better athlete. There were some inspiring people out on that course on Sunday but your honesty is something special too. A huge well done on getting over that bright red finish! Chris – my latest attempt!! Chris, it was a pleasure to meet you and to play a very small part of your battle. As I said it was you that completed that epic race! You have inspired me to push myself harder and further. PS – Racing with a bug,tut tut, you should know better! Can be dangerous,dont do it again! All the best for the birth of the bump – get that baba on a bike asap…! just came to this post randomly, dont know you, but this was freaking awsome, I have goosebumps right now. You are an inspiration.